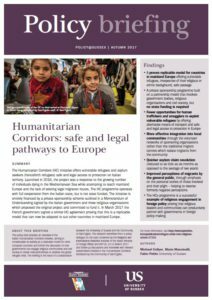 Professor Michael Collyer and Dr Fabio Petito (School of Global Studies, University of Sussex) have released a policy briefing on the Humanitarian Corridors initiative – a new way of helping vulnerable refugees that is gaining momentum in Europe. Launched in Italy in 2016, the project was a response to the growing number of people dying in the Mediterranean Sea while attempting to reach mainland Europe. It is run by religious organisations, in partnership with the government, but no state funding is required. In March 2017, the French government signed a similar agreement, proving that it is a replicable model that can be adapted to suit other countries. The scheme sees vulnerable families and individuals directly sponsored by volunteers and settled into local communities. Help is given with housing, finding a job and language acquisition, as well as quicker and simpler asylum claim resolution. Not only does this mean there are fewer opportunities for human traffickers and smugglers to exploit vulnerable refugees, it also helps with improved perceptions of migrants by the general public. 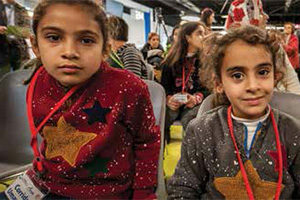 To date, 2000 refugees have benefited from the Humanitarian Corridors programme, most originally from Syria. 52% are female and 37% under the age of 18. Help is available to the most vulnerable, irrespective of their religious or ethnic background.